Something about me must have just screamed easy target, because I can’t understand why I would have otherwise been chosen. I keep a pretty low profile, so I couldn’t have any enemies. My first thought is that it’s a case of mistaken identity, but the guy clearly knows exactly who I am, which means it just doesn’t make any sense. I’m not an important person, and I’m not white, so it’s not like the news was gonna cover my story. Sorry, not sorry, I didn’t make the world the way it is. I’m just some random guy who works at the county recycling center. I don’t even own a car, which is why he found me riding my wee little three-speed bike along the old highway. He pulls up next to me in a cargo van, and it looks like he’s alone. He immediately points a gun at my chest, but says he doesn’t want my money when I offer him a tenner. He just orders me to put this weird-looking choker necklace around my neck. It’s not really my style, but I can’t think of much of a reason to not comply. As soon as it’s fully clasped, he relaxes and smiles with relief. After a moment, he catches his breath, and shows me this little remote, saying that it’s a detonator set to trigger the bomb around my neck if I don’t do what he says. 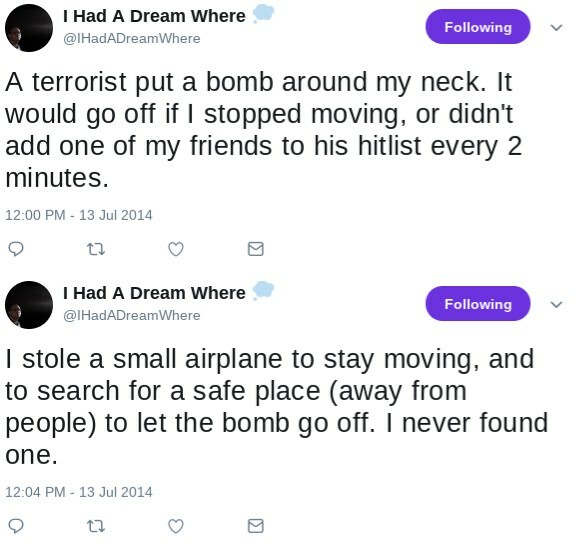 Apparently having seen an overrated action film franchise from the 1990s, he says that the bomb will go off if I don’t keep moving, or if I don’t add the name of another one of my friends to his hitlist every two minutes. When I point out how absurd that is; that I couldn’t conceivably keep up with that kind of timeline, he clears his throat and contends that he said hours, not minutes. That’s doable, not because I’m willing to send one of my friends to their death, but because I’m confident I’ll be able to get this thing off before that will matter. He gives me a minute to retie my shoes, and stretch a little, before he activates the timer. He then hands me a PDA where I’m meant to list my doomed friends. I get back on my bike, and turn around to head for the recycling center. One of my coworkers is a mechanic by trade with an engineer for a mother, so surely she can help. I try to call her on my phone, but I can’t get a signal, even as I’m riding directly underneath what I know for a fact to be a fully operational cell tower. The choker necklace must have its only blocker. Only later do I realize why the guy who’s doing this to me looked so familiar. I met him at a party once. He was my neighbor’s friend, and seemed totally normal. What the hell is going on? I pedal faster as my two hours approaches, but hit a pothole, and bust open both of my tires. There’s no way I’m making it back to work now. I know someone who everyone thinks is my friend, but I secretly hate. If I have to choose anyone to die, and if it means I and everyone else survives, then it might as well be him. It’s a terrible thought, but I would rather it be him than my dentist, or something. I try to jog to get as close to my destination as possible, but it’s pointless. I slow down just enough that I can type out his name without a bunch of spelling mistakes, and beg the flying spaghetti monster for forgiveness. Just when I’m thinking about how I can’t keep this up for much longer, I see the little airstrip I always pass on my way to work. I detour in that direction, and find it surprisingly easy to steal a plane. There is some hope left in the world. I think I can get it to taxi, but takeoff is going to be another issue.